Here's how to import and manage your contact lists on pr.co. The Presslist feature allows you to import and manage your media contacts. It’s a full press CRM tool, which combines your current list of press contacts with action driven data. It allows you to create targeted campaigns using tags to filter contacts (i.e. by media outlet, by subject or by client industry). The Presslist can be used in teams and is searchable, allowing you to quickly identify and select the contacts you need. 1. Go to ‘Presslists’, in the top left menu, then click the green '+segment' button. 2. Pick a name for your new segment of contacts then hit 'create'. Your first segment is still empty. You can create contacts one by one or import them by uploading a .CSV file or an Excel file. If you upload a .csv or excel file, the first row should contain headings so you can match the columns. Match the columns from your file with the fields to be added in your list. The standard fields are: Email, First Name, Last Name, Organisation, Phone number, Tags and Notes, but even more are available. After matching is completed, your contact list is created. You may want to have a 'tag' column with all the tags you'll use to filter your contacts. Think language, country, market, interests, and so on. 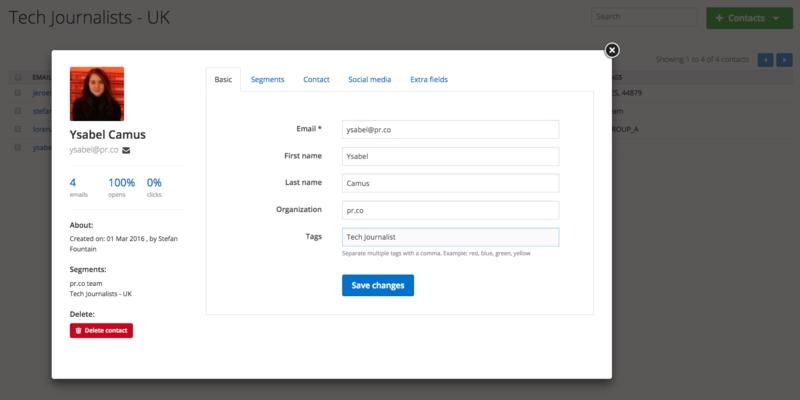 You'll be able to use the tags as a filter, when you select the contacts for your email campaign. Click Continue and you're finished! Now that you have your list, you can edit its entries, add new ones or delete them. After scheduling or publishing your news, you can let journalists and bloggers know about it through custom emails. You can customise every email. Your contacts will receive the message from your own email address. The results of every email campaign is tracked and measured. Who opened your emails? Did you do everything you could to make it easy for them to interact? Did you stress what matters to them and to their audience?